Product descriptions are important for any company, but when chemical labels are involved, it is especially crucial for businesses to adhere to federal and local requirements. According to the United States' Occupational Safety and Health Administration (OSHA), there are approximately 90,000 establishments that create hazardous chemicals. All of those producers must ensure that they are following the latest standards of chemical labels, otherwise they could not only face hefty fines, but those companies could endanger the lives of their employees, customers or anyone who handles the labeled product. How to I pick the right chemical labels? 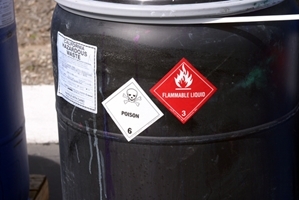 With OSHA's requirements for labeling hazardous chemicals under its Hazard Communication Standard (HCS), it is necessary for companies to have several pieces of information: pictograms, a signal word, hazard and precautionary statements, the product identifier and supplier identification. At DuraFast Label Company, our experts will help you find the right printer so you can stay on top of your label printing needs, while still adhering to federal standards. With chemical label standards subject to change, it can be time consuming to wait on a third-party vendor to send you updated materials. However, with equipment such as an Epson GP-C831 printer, you can be in charge of your own prints. The Epson GP-C831 can print durable labels in mass quantities. The DuraFast Chemical Labels will not smudge and will remain readable, regardless of the harsh environment the product is placed in. Also, the Epson GP-C831 label printer can print DuraFast Chemical Labels up to 8.5 inches by 22 inches, which is an ideal size for drum and other large containers. We can supply your company with DuraFast Chemical Labels that are BS5609 certified, which means they can withstand harsh marine environments. After a three-month test in salt water, we can guarantee that your product's DuraFast Chemical Labels will remain in place and stay legible. Why choose DuraFast Chemical Labels? At DuraFast Label Company, our experts will help you find the necessary materials to keep you up-to-date on current chemical label requirements. Furthermore, our machines can assist you in creating unique labels for your business that still adhere to federal and local guidelines. Contact DuraFast Label Company today so we can find the right machine for you.